India prides itself on its so called diversity but these are just plain talks. The real situation on the ground is terrible for all Northeasterners, especially womenfolk. People from Northeast are racially abused by mainland Indians as “chinkis” This derogatory term means an individual with slanted eyes. Northeastern states of India comprises of Assam, Tripura, Meghalaya, Manipur, Arunachal Pradesh, Sikkim & Mizoram. This region is also referred to as the Seven Sisters. The physical characteristics of the inhabitants of these states are different than the Indian people. Due to which they face racial discrimination in other parts of the country. Northeasterners have oriental looks and are hard-working, friendly people. Northeasterners have oriental looks and are hard-working, friendly people. Matriarchy is practised among many groups in the Northeast. Successive Indian governments neglected this whole region, as a result it has stayed backwards in terms of infrastructure. Tourists need special permits from the government authorities to visit many regions of Northeast India. In 1958, the Indian government passed a law, the Armed Forces Special Act (AFSPA) that applies to various seven Northeastern states. This grants security forces the power to search properties without a warrant, to arrest people and to use deadly force if there is “reasonable suspicion” that a person is acting against the state. Army officers have legal immunity for their actions as per AFSPA; there can be no prosecution, suit or any other legal proceeding against anyone acting under this law. Indian army frequently misuses its power by harassing the residents of Northeast region under the pretext of this draconian law. Sharmila’s primary demand to the Indian government has been the repeal of the Armed Forces (Special Powers) Act (AFSPA). She started her fast in Malom on 5 November 2000 and vowed not to eat, drink, comb her hair or look in a mirror until AFSPA was repealed. She ended her hunger strike on 9 August 2016 after 16 years of fasting. Sadly, AFSPA is still in force. Ordinary people of Northeast India are tormented by Delhi through its army. No major industry exists in this region, therefore, the employment prospects for the locals are practically non-existent. Basic infrastructure like roads and electricity supply is not up to the mark in this area. Youngsters from these parts migrate to big cities of India like Delhi, Bombay, Bangalore etc. to find jobs. The women of North East are good looking and fashion conscious. Majority of Indian males are sexually frustrated perverts. 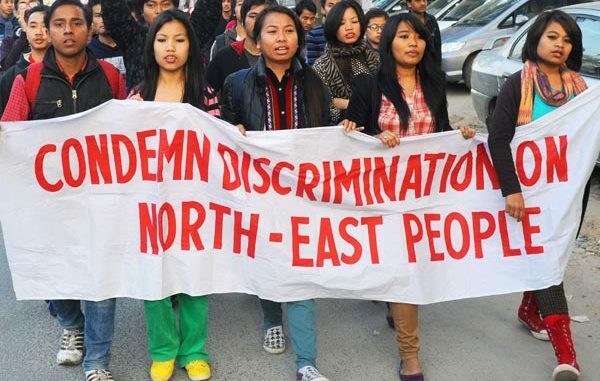 They harass Northeast women on a daily basis. People from Northeast are racially abused by mainland Indians as “chinkis” This derogatory term means an individual with slanted eyes. The same abusive word is also used by the majority of Indians while referring to the Chinese citizens. State of affairs is dreadful in New Delhi, which is the capital city of India. Delhi has many localities known as Urban Villages. These places are just villages in a name. They do not have any farming land. Owners of houses in these neighborhoods have got tall buildings erected by flouting all building laws, regulations in order to build the maximum number of rooms and put them on rent to earn easy tax-free cash. Northeast migrants to Delhi are overcharged higher rents by these deceitful landlords. Urban villages, especially in areas around South Delhi are dominated in particular by a community known as ‘Jats’. They own most of the houses in these parts. The author spent several years in Delhi and sadly witnessed numerous unfortunate incidents in Delhi involving shoddy treatment of Northeast women and girls especially by Jats of urban villages like Katwaria Sarai, Ber Sarai and Munirka. The Jat community comprises of male chauvinists of the worst kind on this planet. They earn huge tax-free income every month as rent from Northeasterners and other migrants to Delhi; as a result, most of them don’t do much productive work. They just sit in groups, play cards and drink liquor from morning-night. All Indian political parties are scared of Jats as they resort to hooliganism to blackmail central as well as state governments in order to get concessions for their community. These Jat men have made the life of Northeastern women in Delhi a living hell. These Northeastern women cannot go back to their homes in Northeast because they face sexual violence at the hands of Indian army personnel furthermore; there are no job prospects in the region. They are teased, sexually harassed and even raped by these unscrupulous Jat house owners and their family members. Delhi Police also has plenty of Jat personnel so, these poor, unfortunate Northeast women cannot even complain about their ordeal to the Police. A few women, who gather the courage to approach police stations to lodge complaints are ridiculed and abused by the Police staff as women of loose character, ‘chinki whores’ etc. Northeasterners are highly depressed and frustrated due to this daily ordeal. Their culture, language, food habits and norms are all entirely different from the mainland Indians. “No taxation without representation”, this slogan originated during the 1750’s and 1760’s in U.S.A. It summarized the primary grievance of American colonists in the thirteen colonies against the British Parliament. This ultimately culminated in the successful American Revolution. Northeastern citizens across the entire length and breadth of India should unite under the slogan; “No voting without safety & respect.” Election Commission of India has introduced NOTA (None of the above) on the ballot papers as an option for the voters. It means that the voter does not find any political party’s candidate competent enough, that’s why they exercise the NOTA option by not voting for a candidate of any political party. If, the ordinary residents of all seven northeastern states unite together and press NOTA during all state assembly as well as Parliamentary elections, then their local politicians, as well as political parties in Delhi, would definitely wake up to their serious grievances and initiate measures to prevent this dastardly treatment meted out to Northeast citizens in India. Footnote- This composition is dedicated to three beautiful, kind, compassionate, independent & friendly girls from Northeast India. Suzie, Tanya and Mikii were friends of the author in Delhi during the late 1990’s before we lost contact with each other. These girls were unfortunate victims of numerous atrocities perpetrated on them by Jats. The writer sincerely hopes that all three of them are presently leading happy, peaceful lives somewhere and women from the Northeast region of India do not face any future trauma in Delhi as well as other cities in India. The writer sincerely hopes that all three of them are presently leading happy, peaceful lives somewhere and women from the Northeast region of India do not face any future trauma in Delhi as well as other cities in India.